My daughter’s birthday party was all about following the yellow brick road, so I designed and created this Yellow Brick Road Cake myself. I found the emerald city light up on eBay for the topper. Used white cake with rainbow confetti, and lemon filling. Green buttercream frosting, and used fondant for the yellow brick road. I laminated a picture of my daughter. I would like to know where you got your figures for your cake. 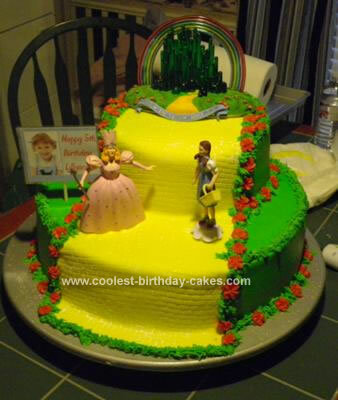 My niece is wanting a Wizard of the Oz cake and I’m having trouble finding them. Please let me know. I love this cake and would like to duplicate it for my 3 year old daughters up coming birthday. I can’t seem to find the Emerald City figurine, or anything like it, anywhere. Do you know where it can be found or the name of the maker so that it might facilitate me in searching for it? Thanks.